First distributed by United Press International. 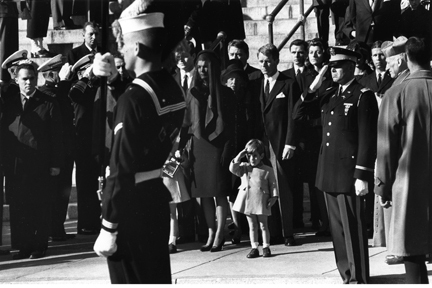 I was chosen to walk with Jacqueline Kennedy and world leaders from the White House to the Cathedral of St. Matthew the Apostle for President John F. Kennedy's funeral service on November 25, 1963. When we got there I had to go behind the ropes with the other 70-odd photographers. All squeezed in an area for 30. Wow! UPI photographer Frank Cancellare squeezed me in next to him. When the service started inside, Cancy and I discussed what to do as a team. I had the longest lens, a 200-mm. He shot like I was not next to him, and I just watched Jackie. She bent down and whispered in her son's ear. 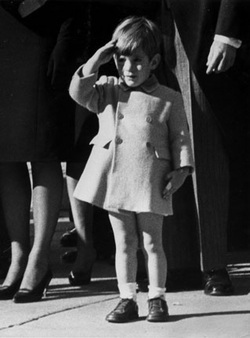 John-John's hand came up to a salute. Click! One exposure on a roll of 36 exposures. As the caisson was rolling out to Arlington Cemetery I asked every photographer I could if they had the salute. Duh! Nobody saw it. Everyone I talked to had been concentrating on Jackie and the caisson. At this point I made a decision to walk the film into the bureau feeling I had the picture of the funeral. I was supposed to walk with the caisson to Arlington. I knew we had photographers along the way and at least four at the cemetery. They could do without me. When I walked in the office George Gaylin (Washington Newspictures Manager) almost had a heart attack. I have never seen a man that mad. He turned red then white. Yelling and screaming that I did not go to Arlington. I kept telling him I had THE PICTURE of the funeral. He was yelling that he had rolls and rolls of film from ump-teen photographers covering the funeral. While Harold Blumenfeld (Executive Editor for News Pictures) and Ted Majeski (Managing Editor for News Pictures) were trying to calm him down, Frank Tremaine (Vice President, General Manager for News Pictures) grabbed me by the collar and said: "You better have the picture of the funeral or you're fired." Knowing it was going to be a big enlargement, and knowing my job was on the line, I went into the darkroom with fine grain developer to develop the film. Unheard of at UPI. It took 17 min. I could hear Gaylin pacing outside the door muttering. When the negative was washed and dried I went to Gaylin's desk. He looked at it and yelled! "He does have the picture of the funeral." He quickly showed it to Ted Majeski and Harry Blumenfield on his way to have it enlarged and printed. The rest is history. A WORLD BEATER for UPI. When the photo was transmitted the credit was UPI/ by Stan Stearns. Back then that was almost unheard of. Reporters got a byline, photographers got zip. The photo was used world wide. Full page in some newspapers and magazines. A few with credit to UPI/Stan Stearns. Life [magazine] used it with no credit. I called the Life picture editor about the credit. He said would correct it in the future. He did. Well, in 1999 when JFK, Jr. died, he [the picture editor] either had moved on or no one looked at the credit or they got it direct from Corbis. The credit was Corbis-Bettman on the cover of Life and Time. I am proud to have added this photo to history. Photograph by Stan Stearns. First distributed by United Press International. Other photographers, including the New York Daily News did have the image, but they didn't have what Stearn's picture had. a tiny highlight of sunlight under young John's left eye. It gave more "roundness" to the face.